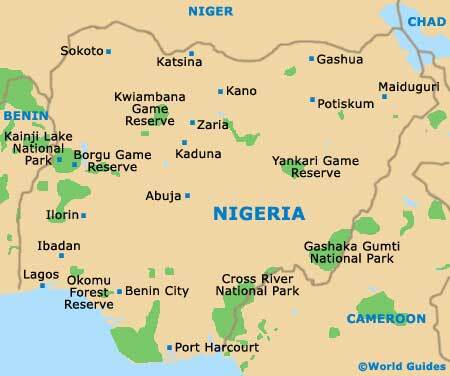 Compared to many other African destinations, Nigeria's tourist potential remains relatively untapped. That state of affairs can certainly have its advantages, with fewer crowds at tourist attractions and more of a unspoiled atmosphere for visitors to soak up and enjoy. The main draw cards range from historic and modern buildings, to zoos, parks and coastal attractions. Many are pleasantly surprised to find some very reasonable beaches in Nigeria, particularly on connected Lagos Island, where they are accompanied by quality sightseeing opportunities, such as both Oba's Palace and the Shitta Mosque. Families staying in Abuja should consider spending time at the National Children's Park and Zoo, which is sure to be a big hit all round. Nestling in the tropical rainforests of Nigeria's Northern Cross River State, the Obudu Cattle Ranch Resort is often now referred to as the Obudu Mountain Resort and has become an increasingly popular visitor attraction in recent years. Its facilities include hotels and a golf course, as well as wildlife and water parks, complete with swimming pools and fun water slides. 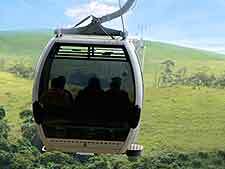 Visitors can get a bird's eye view of the resort either by braving the canopy walkways or by taking a cable car ride. 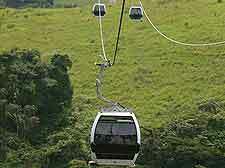 These cable cars transport passengers from the entrance, all the way to the ranch at the top of the neighbouring hill. Oba's Palace is still the residence of the current Oba of Lagos. Parts of the building date back to the 18th century and were the work of the Portuguese. The Palace also incorporates a number of more modern sections, some of which were added as recently as the 1960s. It is possible to tour the palace, although you will first need to obtain the necessary permission from the authorities. The Shitta Mosque is a notable religious building serving the Muslim population of Lagos. This mosque was built by Shitta Bey, a slave who came originally from Sierra Leone and ended up returning to Lagos in 1885 as a very wealthy man, becoming a leader of the local Muslim community. The mosque was designed by a Brazilian in the latter part of the 19th century and was officially opened by the British Governor of Lagos at that time. Of note, when entering the mosque, you will need to observe the strict dress code, such as long skirts and scarves for ladies, and trousers (not shorts) for men. Evidence of the ancient Nok civilisation was discovered during mining work, when archaeologists uncovered tools, rock paintings, burial sites and stone sculptures. The people of Nok village who made these objects appear to have enjoyed an advanced social system and culture for over 2,500 years, finally fading from the scene around 200 AD. Today, visitors to the present Nok Village, in Kaduna State, can admire the unusual sculptures, which depict humans and animals, although there is still little evidence of what they were used for. 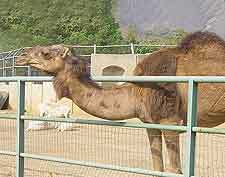 Abuja's zoo is located on the north-easterly side of the city, just off the Murtala Muhammed Expressway North, where it sits under the shadow of nearby Aso Rock. For animal lovers, there is plenty of wildlife to admire here, with attractions including camels, crocodiles, elephants, giraffes, monkeys, ostriches, tortoises, wild cats and zebras. Domestic animals are also housed in the zoo, making it a great attraction for younger children too. In fact, playgrounds and other kiddy friendly activities along 'Toddler's Lane' make this an ideal place to while away an afternoon or enjoy a picnic. The Lake Cafe is on hand should you require a hot snack or a freshly made milkshake. Located in the heart of Kano's old city district, this palace dates back to the 15th century. The palace complex is surrounded by a gated high wall, with the northernmost section of the Emir's Palace being open to the public. However, as the palace is still the current Emir's residence, the rest of the complex is accessible by invitation only. Nevertheless, the architectural splendour makes even a look from the outside worth your while. 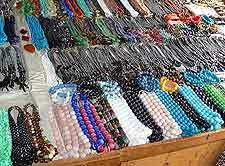 The markets on Lagos Island have become one of the principal attractions and are especially appealing to tourists and souvenir hunters. Located just off Adeyinka Oyekan Avenue is the Jankara Market, where colourful textiles and local specialities can be found. At the Balogun Market, next to Breadfruit Street, is a further selection of fabric, originating from throughout West Africa. Lying alongside Lewis Street is the Sandgrouse Market and its wealth of tasty food and drink. The Osun Sacred Forest has become something of a shrine for the Yoruba religion and this whole area is known for its plentiful modern art and busy market (Oja Oba Market). Visitors to this tranquil oasis can expect lush groves, decorated with sculptures and ornate shrines paying tribute to various deities. The forest is a pleasant place for a relaxing stroll and now ranks as a World Heritage Site, being awarded this prestigious title in 2006.